A global spotlight will shine brightly upon Royal Windsor on 19th May 2018 for the marriage of Prince Harry and Meghan Markle. 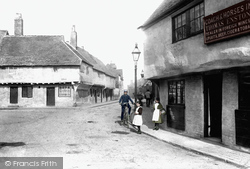 We bring you photos from The Francis Frith Collection of this beautiful town. Our best wishes to the happy couple, and we hope they have a wonderful day. Windsor is dominated by its famous castle, the principal residence of the sovereigns of the United Kingdom and the largest continually inhabited medieval castle in the world. Founded by William the Conqueror in the 11th century, the oldest parts of the present castle date from the 12th century, including the Round Tower, but much of it dates from the 1820s, when King George IV spent a huge sum renovating and extending it. St George’s Chapel is the chapel of the Order of the Garter, the chivalric order founded by King Edward III in 1348, and the Knights’ banners hang over its Quire stalls, as seen in this photograph. The Order originally honoured knightly valour, but today’s Knights of the Garter are chosen from people who have served their country notably, or achieved something exceptional. 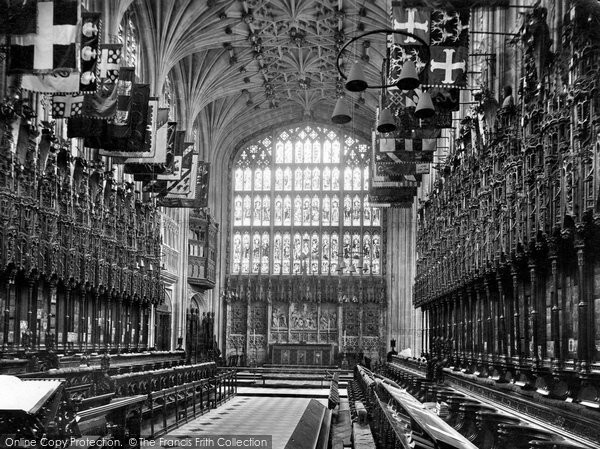 Photo: Windsor, The Castle, St George's Chapel, The Choir 1895. 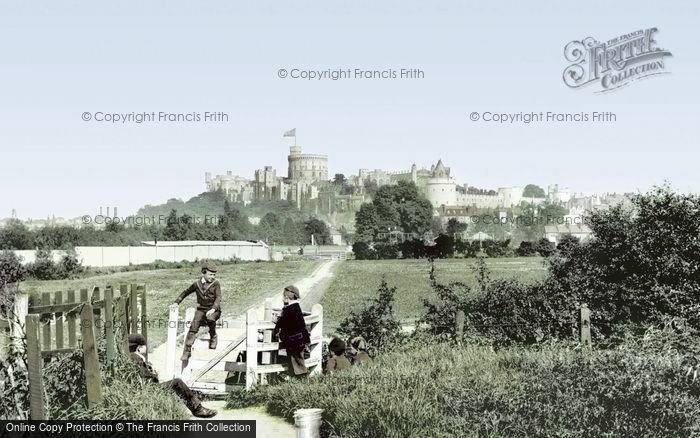 Photo: Windsor, Castle From Clewer Path 1890. At the time of the First World War, in the reign of King George V, the British Royal Family was known by its ‘house’, or dynasty, of ‘Saxe-Coburg-Gotha’. However, anti-German feeling during the war caused the Royal Family to look for a new name. 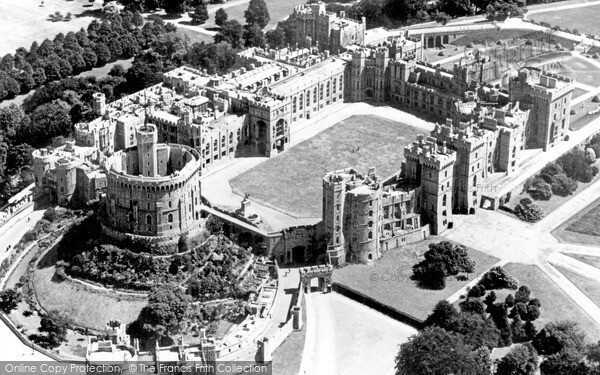 King George loved Windsor Castle, so in 1917 the Royal Family adopted ‘Windsor’ not only as the new name for the Royal House, but also as the surname of the Royal Family. Photo: Windsor, Castle, The East Terrace 1914. St George's Hall will be the venue of the first of two receptions for the newly married couple on the 19th May. 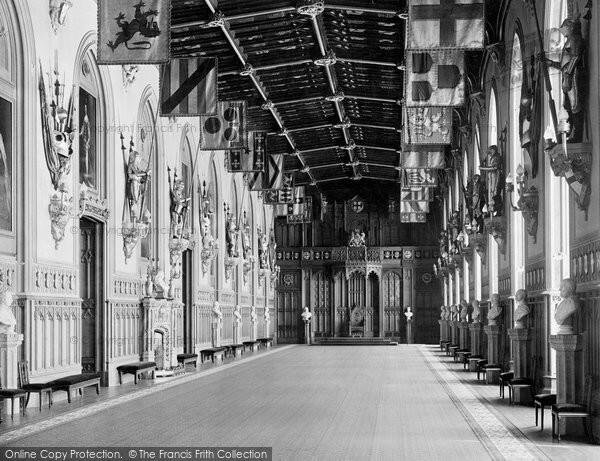 Swords and armour bedeck the walls of St George’s Hall of Windsor Castle in this photograph taken in 1923. The hall was severely damaged in the fire at the castle in 1992, and has since been completely rebuilt. 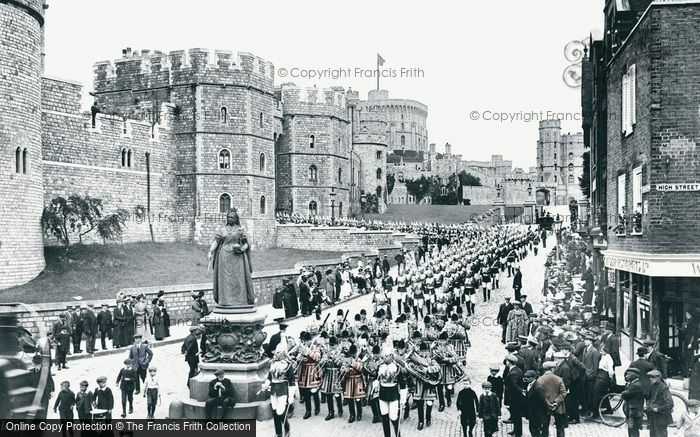 Photo: Windsor, Castle, St George's Hall 1923. 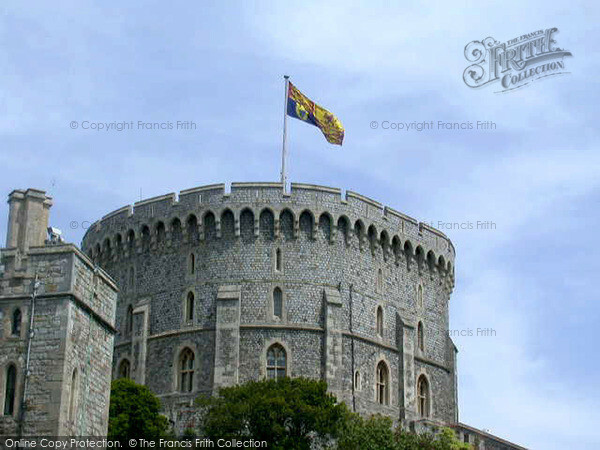 The Royal Standard will certainly by flying above Windsor Castle on May 19th! Photo: Windsor, Royal Standard 2004. The magnificent building to the right of the castle precinct in this view is St George’s Chapel, constructed between 1475 and 1528, where the royal wedding will take place. The nave was completed in 1509 under the great master mason and architect William Vertue, who may be represented by the figure of a workman in the bottom right-hand pane of the great west window. 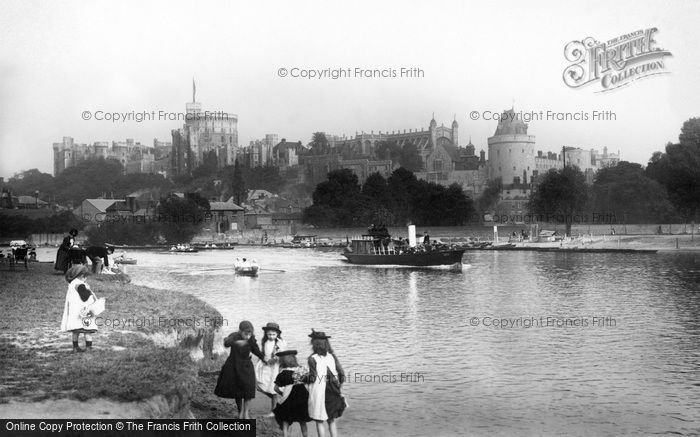 Photo: Windsor, Castle From The River Thames 1895. 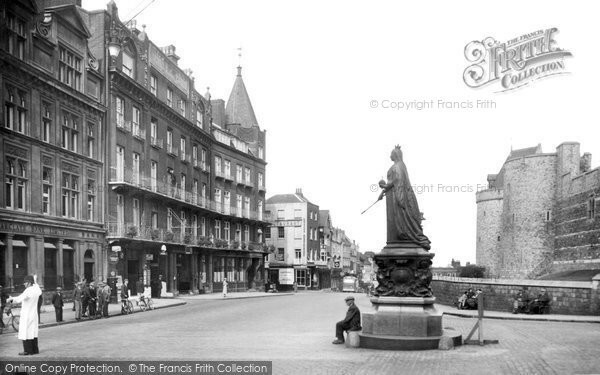 The statue of Queen Victoria at the junction of Castle Hill and Windsor’s High Street commemorates her Golden Jubilee of 1887. Inside the plinth of the statue is a sealed Doulton jar containing every coin in circulation at that time. 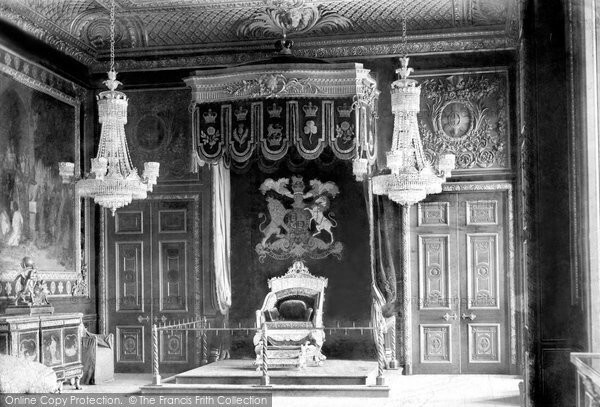 Photo: Windsor, The Castle, Throne Room 1895. There will certainly be more than one policeman on duty in Windsor directing traffic and spectators on Harry and Meghan’s big day! 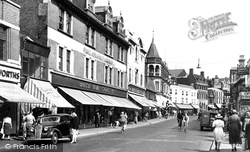 Photo: Windsor, High Street 1937. 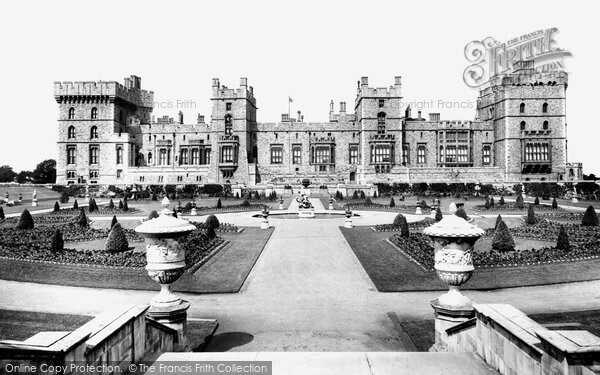 If you liked our "Royal Windsor" Blog Feature, you might like to see and follow this Francis Frith board over on Pinterest. 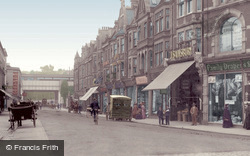 Follow Francis Frith's board on Pinterest. This post has the following tags: Archives,Places.